Ascending Butterfly: "Fall Into Bags' - Elliott Lucca's Granada Trapezoid Satchel in Twilight Giveaway! 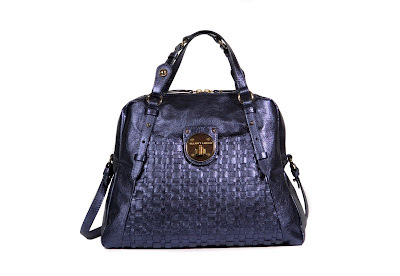 "Fall Into Bags' - Elliott Lucca's Granada Trapezoid Satchel in Twilight Giveaway! This giveaway is now CLOSED. Thanks so much to our wonderful sponsor Elliot Lucca! We look forward to working with you again! The winner is Courtney S. Remember: There are great giveaways active on the upper right hand side of the page! We are delighted that our ongoing Handbag feature is back with a decidedly Hot, Leather Handbag in a great fall color! You know how much Ascending Butterfly personally loves companies that give back, and we've been keeping you abreast of the incredible work that The Sak Brand Group (Elliott Lucca's parent company) has been doing with America SCORES - whose mission is to empower students in urban communities using soccer, writing, creative expression, and service-learning. With teamwork as the unifying value, they inspire youth to lead healthy lifestyles, be engaged students, and become agents of change in their communities. I have always had a particular soft spot for children's charities, and I love that America SCORES focuses on urban communities where school districts barely receive adequate funding. I applaud The Sak Brand Group for partnering with an organization that is helping to making a difference in the lives of more than 6,000 youth! I also have a passion for leather handbags that is by now of no surprise to you! I've seen various reports saying that Purple, Grey and Red are going to be the 'IT' colors for handbags this Fall, and as I love all three, I'm looking forward to the offerings this season! I have been testing out an amazing Fall Bag from Elliott Lucca, the "Granada Solid Trapezoid Satchel" in a color called 'boysenberry'. Its shape is somewhat reminiscent of a Doctor's Bag, and the Front outside pocket features a super hot turnlock closure! I love that it plays up trends well without being so over the top that you would only whip it out on special occassions! I look for a solid investment in my handbags, and this bag does not disappoint! Fellow public transportation commuters you'll love that Elliott Lucca remembers to include a longer strap so you can also wear it over the shoulder and keep your hands free! Without the strap it still has a very generous drop, but if you experience super cold winters where you are, and love to layer like I do, you'll probably want to switch to the longer strap once it gets colder out! In addition to the front outside pocket, the lining features two multi function pockets and a zippered backwall pocket. I love having organizational pockets to keep my Mp3 Player, Cell Phone and Digital Camera safe while in transit in my bag! I love that this bag is super roomy, but not so big that a shorter statured person would hate the silhoutte. (Thankfully I'm pretty tall so I can carry pretty much any silhoutte in a bag!) I can carry what I need to have with me on a day-to-day basis without the need for multiple bags or additional totes. It's a quality bag, but does not add that unwanted heft that come with some bags. Some bags are just so heavy on their own that by the time you add your own stuff, your shoulders hurt at the end of the day, or you end up walking with one shoulder higher than the other. I'm happy to report I did not experience this with the Granada Bag! When I invest in a bag I always ask myself two questions (1) Is this a 'one-season wonder'? (2) Does the color work well with my wardrobe? - I am happy to report that my answers to these questions with the Granada are a (1) No - The structure will carry forward for way more than one season and (2) Yes, while Purple is a bold color the fact that it is not overly embellished means it works much like a neutral yet still stands out in the crowd. •Dimensions: 14"L x 6.25"W x 11.25"H Drop:5"
•Convertible Shoulder Strap, Drop: 15.25"
•Care Instructions: Clean with a water-based leather cleaner and moisturizer. Use a protective spray to protect the leather surface. Ƹ̵̡Ӝ̵̨̄Ʒ - How to Win: (1) You must be a PUBLIC follower of Ascending Butterfly to be eligible for this and all giveaways. Indicate in your entry that you follow (if your 'comment name/user id' differs from your profile id, please let me know what name you follow under) and (2) Visit Elliott Lucca and pick another bag (other than the one being reviewed and the one being given away!) that you like and leave the LINK to that bag in your comment entry! (3) Elliott Lucca would like to keep you informed of sales and happenings, entering this giveaway is your consent for them to do so, so you MUST also leave your email address somewhere in your comment. (You can format it this way for security, example: ascendingbutterfly AT mail host DOT com). (If your email is clearly visible in your profile, you can just say so, that's OK!) Please follow the easy 1, 2, 3 steps to winning (or in this case, the A,B,C’s of winning!) This giveaway is open to USA residents who are 18 years of age or older. I am following you via Facebook: Nicole O.
I am following you via Networked Blogs: Nicole O. My email is available in my profile. I like Elliot Lucca on FB (Nicole Krebs Balogh) and posted on their wall that you sent me. I follow Elliot Lucca on Twitter @maybaby522. I like Ascending Butterfly on FB (Nicole Krebs Balogh). I follow on Networked Blogs (Nicole Krebs Balogh). I am part of Ascending Butterfly's community group as maybaby522. I voted for you at Blogger's Choice Awards. I voted for you on bloggers choice awards - good luck! I like Elliott Luca on Facebook - my FB name is Amanda Moore. And I posted on their wall that you sent me! awesome! i like the convertible hobo! i voted for you on the blogger awards! #48! good luck! Following the blog via GFC(Publicly). Their Cielo Bag also caught my eye! 1)LIKE Elliot Lucca on Facebook/wrote on their wall! 2)LIKE Elliot Lucca on Facebook/wrote on their wall! 3)LIKE Elliot Lucca on Facebook/wrote on their wall! Follow the blog on NetworkedBlogs. I Reviewed Ascending Butterfly on Alexa! I Voted at Fuel My Blog. goodluck! I Joined the Ascending Butterfly online community! Voted at the Blogger's Choice Awards! I follow your blog via google friend! I love the Raven Hobo in black! 1. I publically follow your blog. I like the Cielo Dome Satchel in Chocolate. I follow via GFC. I like the Napoli Draw Tote. I am a public follower of Ascending Butterfly through Google Friend Connect. I like the Feria Tote. voted for you at "best blog about stuff category." I follow GFC via my Twitter, @hailey_grace. I like this bag - totally digging the hardware: http://www.elliottlucca.com/Feria_Tote/pd/c/195/np/195/p/1132.html. I signed up for elliott lucca's newsletter - herlongwayhome at gmail dot com. This is the bag I would want. I like Elliott Lucca on Facebook as Katy Morris and wrote on their wall that you sent me. I follow Elliott Lucca on Twitter as @katygmorris. I just Dugg this giveaway at Digg as katygmorris. I just submitted this giveaway as a favorite on Technorati as katygmorris. I already like you on Facebook as Katy Morris. I already follow you with Networked Blogs as Katy Morris. I'm already a member of your community/ chat group as katygmorris. I just voted for you on Fuel My Blog as katygmorris. I gave you a 5-star review on Alexa as katygmorris. I use the email address below as my sign-in there. I just voted for you on Blogger's Choice as katygmorris. Good luck! I publically follow you with GFC as katygmorris.